We are continuing to monitor the weather forecasts and are putting plans in place to address any potential outages the weather may bring. The forecast continues to evolve, but obviously the greatest concern right now is with the chance of heavy wet snow that can bring down branches and cause damage to the electrical system; as well as the chance for icy conditions late on Sunday. We will be opening up storm rooms and staging sites in Massachusetts and will have additional National Grid staff on hand prepared to handle wires down calls, damage assessment, substation, transmission and underground needs. • Never touch downed power lines, and always assume that any fallen lines are live electric wires. If you see one, report it immediately to National Grid or your local emergency response organization. • Power problems can sometimes interrupt public water supply systems or disable well pumps, so it’s an especially good idea to keep a supply of bottled drinking water handy, as well as some canned food. • People who depend on electric-powered life support equipment, such as a respirator, should let National Grid know. To register as a life support customer, call the company’s Customer Service Center at 1-800-322-3223. • Check on elderly family members, neighbors and others who may need assistance during an outage period. • If you use a generator to supply power during an outage, be sure to operate it outdoors. Before operating generators, disconnect from National Grid’s system by shutting off the main breaker located in the electric service panel. Failure to do this could jeopardize the safety of line crews and the public. • If you lose power, turn off any appliances that were on when the power went off, but leave one light on so you will know when power is restored. • Reminder: It’s not safe to work in an elevated bucket during periods of increased wind gusts. Our line workers begin restoration work only when conditions are deemed safe. • Natural gas customers should closely inspect areas around and over gas meters, service hook-ups and vents for ice and snow that could damage equipment or prevent CO from properly venting. o Get Out - All occupants should leave the house immediately. Do not use the telephone or light switches for any reason. o Stay Out - Do not return to your home until National Grid tells you it is safe. • Report power outages at www.nationalgridus.com or call 1-800-465-1212. • Receive text message alerts and updates when you text the word STORM to NGRID (64743). • Use your mobile device to track outage information and storm-related safety tips through National Grid’s mobile site accessible at www.ngrid.com/mobile. • Like us on Facebook and follow us on Twitter and Instagram; we post all the latest storm and restoration updates. Please contact me at 617-263-3380 if you have any questions. Free Coffee, Tickets and Gas Points Oh My! Yes you read right! How safe driving can help save you money. Plymouth Rock Assurance, one of our agency’s leading carries, is turning safe driving into real, everyday rewards with the simple click of a button. Just download the Road Rewards App and start driving. It’s as easy as that! The smoother and safer you drive, you will have no problem racking up points! YOU are in control! Help keep our roads safe by decreasing distracted driving and reducing aggressive driving habits. If you are a Plymouth Rock customer and don’t have the app downloaded, you are missing out! It just takes a few seconds to download! The Road Rewards app is available for use by the general public, but to earn rewards you must be listed as an insured operator on a Connecticut or Massachusetts personal auto insurance policy issued by Plymouth Rock Assurance Corporation or a New Hampshire personal auto insurance policy issued by Mt. Washington Assurance Corporation. In Massachusetts eligibility is limited to policies having effective dates on or after February 1, 2018. Other terms and conditions apply. Should you have any questions, visit our Road Rewards FAQ page or call our Customer Solutions team at 855-993-4470. Trick-or-Treat! The famous Halloween saying and American practice since the early 1900s. All the ghouls, ghosts and goblins will be roaming tonight. Neighborhoods and streets will be filled with children in costumes ringing doorbells asking to have their bags filled with candy. Families have decorated their homes, yards, and basements for haunted houses waiting for trick-or-treaters to come by. The spirit of Halloween has spread! With that being said, it can be a very scary night for some. In order for the night to not get scarier than it already is, please keep the following tips in mind from us and our friends from Travelers. Don’t be too frightened by the risks of Halloween but it is important to keep these safety tips in mind while also having fun! For newly licensed drivers, getting behind the wheel for the first time can be very exciting for teens, but very worrisome for parents. At Barrows Insurance Agency, we recognize that Massachusetts teen drivers are at risk and need extra care, support and guidance before getting behind the wheel. National Teen Driver Safety week always falls in the third week of October and is an opportunity to raise awareness about the importance of teen driver safety initiatives. Congress established National Teen Driver Safety Week in 2007 after a series of tragic accidents involving Pennsylvania High School students. These tragedies occurred by inexperience and driver error due to the lack of awareness on distraction such as fatigue, speeding, cell phone usage and driving with multiple teen passengers. In the Commonwealth of Massachusetts, young driver safety is at the top of list. There are some specific tips new drivers can take to stay safe when they get ready to turn that key and put their foot on the gas. Slow down- speeding is a major cause of teen driving deaths, and those in the Junior Operator License category can have their license suspended on their first offense. ALWAYS WEAR YOUR SEATBELT- having a properly fastened seat belt can save a driver’s life (also a safety law in Mass.). According to the National Highway Traffic Safety Administration (NHTSA), 56% of teens who died in crashes in 2009 were NOT wearing their seat belt. Don’t drive tired/feeling fatigued- trying to operate a vehicle with little sleep can also put your life at risk. According to the NHTSA, roughly 100,000 crashes each year are due to drowsy driving. This caused about 1,550 deaths. Night restrictions- young drivers are prohibited from using their vehicles from midnight to 5 a.m., until they turn 18 years old. Passenger limits- for the first 6 months of driving, operators under the age of 18 cannot drive with passengers who are also younger than 18 years old, unless, however it is a sibling. Mobile device ban- drivers under 18 years old cannot use a cell phones and texting (THIS SHOULD APPLY TO ALL) while operating a vehicle for any reason other than informing authorities of an emergency, another Massachusetts safety law. That feeling when you’re sitting in the drivers seat after you have finished your road test, waiting for your instructor to give you that piece of paper that says “Congratulations” is one feeling you will never forget. BUT, in order to hold on to that rewarding feeling, make sure you follow the rules of the road! Happy & Safe Driving! How much could you be saving on your insurance? Most lawn care businesses aren’t comparing their insurance policies as often as they should be. Lawn care business insurance has very specific coverage needs, and without the right types of insurance, you could easily be paying too much or not getting the types of coverage that you need. Here are some things you should consider when choosing an insurance agency. Does the Agency Have Other Lawn Care Companies? Do they offer custom tailored packages for others in the lawn care business? Or are they simply going to give you generic business insurance? The more specialized an agency is in providing insurance for a lawn care company, the more likely you are to get better service and better coverage. Different industries require different levels of insurance. As a lawn care company, you have different coverage needs and policy details that impact your business. Insurance companies that do specialize in lawn care may even have specific plans that have been created for your needs and the ability to further fine tune them to match your insurance needs. When making claims, a company that already deals with lawn care companies will understand your claims better and get you the help that you need. Companies that do not understand the lawn care business may have more questions about the equipment you use, your employees, and your general work operations. Lawn care business insurance isn’t just about the insurance package. After all, auto insurance comes with roadside assistance, and many homeowner’s insurance policies cover emergency hotel stays. Ask your insurance company what added value they offer. These additional services are what may help you decide between similar insurance agencies. Are There Flexible Billing Options? As a lawn care business, you’re likely not doing business throughout the year. Instead, you’re probably doing a great deal of seasonal work. You may not want to be paying high premiums during your off time. Seasonal billing options, payment plans, and other flexible billing can help you maintain positive cash flow throughout the year, rather than having to plan for extra expenditures during off seasons. How Many Agents Will I Work With? Ideally, you want to have a major point-of-contact with your agency; someone who deeply understands your company and your needs. But you also want to know that there’s someone else to handle your work if that agent becomes ill, takes a vacation, or is simply burdened with other work. Look at how many agents the agency has and ask questions about who you’ll be working directly with. Often, when you have an insurance question or a claim to process, it’s an urgent situation. How Hands-On Are the Agents? What is the scope of the work they’re providing? Are they simply going to send you a billing statement every month and wait for you to make a claim? Or will they be able to help you manage your insurance-related needs, conduct annual reviews, and make adjustments to your coverage as you grow your lawn care business? Though nearly any insurance company can insure a lawn care business, not all insurance companies are going to be able to deliver the services, coverage, and pricing that a lawn care company needs. When choosing an agency, it’s worth it to do a little research and ask the above questions. The U.S. Fire Administration reports that there were 1,345,500 fires throughout 2015, totaling 15,700 in injuries and a monetary loss of $14.3 billion. According to the Small Business Administration, as many as 30 percent of businesses that suffer a major disaster do not reopen afterwards. 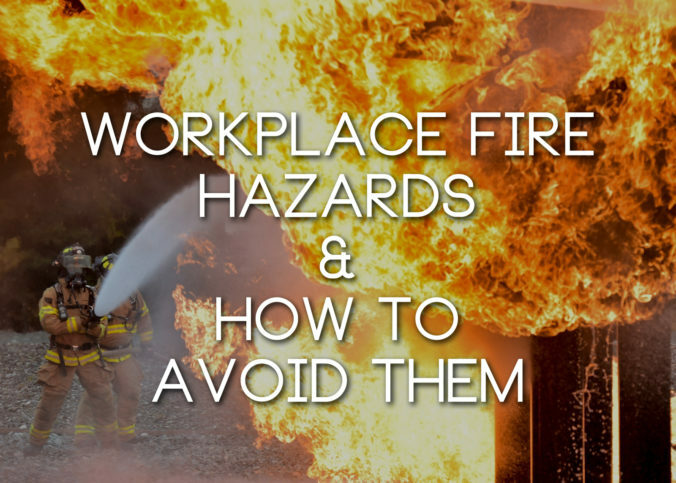 But how can you ensure that your business and your employees are safe from workplace fire hazards? Get a regular inspection to ensure that your electrical system is up to code. Annually, you should have your building inspected by the fire department — they complete these walkthrough inspections regularly, and will also check and recharge your fire extinguishers. If you’re moving into a new building, the electrical system should be one of the first things you check. Train your employees. Employees should know to avoid open flame; candles are major workplace fire hazards, as they are often left unattended and can re-ignite even if snuffed out. Employees should have regular fire drills and these fire drills should be taken seriously. Have fire extinguishers available. A fire extinguisher should be in every room of the building in a visible and accessible location. However, employees should be aware that they should never attempt to put out a fire at risk to themselves; it is better for them to let a large fire burn and evacuate than attempt to fight it. Fire extinguishers are best used as evacuation tools. Protect your assets. Physical documents should be kept in a fireproof safe. This includes things such as external hard drives or flash drives which could have important information on them. A significant portion of disaster recovery lies in data recovery, as many businesses are not able to function without their data. Make sure your fire detectors work. A malfunctioning fire detector is a major contributor to workplace fire hazards, as employees may not know until too late that a fire has occurred. Test your fire detectors annually. Consider a sprinkler system. If your building doesn’t already have a sprinkler system installed, installing one can make the business as a whole much safer. Sprinkler systems will make it easier for employees to get out of the building once a fire has started. Empower employees. Always have an employee on staff, such as a manager, who is expressly given the position of calling emergency services as soon as possible. Empowering an individual with this responsibility is the best way to avoid “bystander effect,” in which all employees assume someone else has called. Evacuate completely. Encourage employees to evacuate the building completely. Even if the fire damage appears minimal, employees should not attempt to go back in to look for other staff members or to try to get their things. A fire may still be smoldering out of sight. You can’t always eliminate workplace fire hazards, but you can reduce your risk through the above steps. Through a combination of preparedness and employee training, you can ensure that if a fire does occur, the damage is minimal. Is your property covered? Renting is an excellent choice for those who want to remain mobile or simply don’t want to purchase a home. But without Massachusetts renters insurance, an individual’s property could potentially be at risk. There are some things that renters should be aware of, both regarding their personal property and their rights. Here are a few highlights of what a renter should know. Landlords can’t charge anything they want for security deposits. Most states have an upper limit on how much a landlord can charge, even if there are mitigating factors, such as a poor credit score. Landlords have to make necessary repairs, such as heating and air conditioning repairs, and perform maintenance in a reasonable amount of time. If they do not, you may be able to make the repairs yourself and take out the amount of the repairs from your rent. Before entering your home, a landlord has to give prior notice. This notice has to be reasonable: they need to notify you in 24 hours and give you a time parameter. They cannot tell you they will be entering “sometime in the next month” or anything equally vague. Landlords have a duty to mitigate their damages. In other words, if you leave early in your lease, they can charge you for leaving early, but they cannot charge you the full amount of the entire term without making an honest effort to fill the space. If another tenant steps in, they cannot collect rent from you both. You need to be provided your deposit back at least 30 days after you’ve moved out. If the deposit was consumed by repairs and other expenses, then the landlord will need to itemize these before the 30 days is out. In most states, the deposit cannot be used for rent that was owed. Landlords cannot keep your property because you didn’t pay rent, and, in fact, that may be a case for your Massachusetts renters insurance policy. They are not allowed to throw out or damage your property until it has been legally abandoned. Landlords cannot perform self help evictions, which are evictions that include changing the locks, turning off utilities, or otherwise forcing you out through unpleasantness. They also cannot evict you without a court order. Damages related to this may also fall under your Massachusetts renters insurance policy. Landlords cannot retaliate against tenants by evicting them or ending their lease because the tenants have complained about or enforced their own personal rights. A lease that has verbiage stating what is illegal is not necessarily a legally binding clause of the contract, as the local laws will trump the legality of the clause. In such a situation, a tenant may be able to terminate the agreement, due to this. Tenants need to know their rights, because landlords do. If you decide to rent, you should brush up on the Landlord-Tenant code in your area, in addition to getting a renters insurance policy that suits you and your property. After a fire, flood, or windstorm, how does your insurance company know how much to reimburse you? Apart from the appraised value of your home, your insurance company will use your list of assets. A detailed inventory of your home will be needed, in addition to documentation regarding how much that item cost. If you don’t inventory your home, you may find yourself being reimbursed for far less than you are actually owed. You can begin to inventory your home by walking from room to room, listing the items inside of it. If the item has a serial number, write it down; this will become important if you lose your items or if they’re stolen. Be as descriptive as possible: rather than “black coffee maker” write down the make, model number, and when the maker was purchased. You can make the list anywhere: paper, a spreadsheet, or a text document. What’s most important is that you are as detailed as possible and that you update this list frequently. Smartphones have made it easier to take a visual record of your assets. Get video and photos of your home, so anything that you miss will be recorded and you’ll have clear documentation regarding what you had. Make sure digital copies are saved somewhere other than just locally; you don’t want your list to be on a computer that is damaged in a fire or a flood. Visual records are also a good way to show that you had an item at a specific date and that it was in good condition. This can be important if there’s some dispute about the current condition of an item and whether it is worth replacing. Receipts, appraisals, and other documentation should all be digitized so you can upload them to the cloud or to another document server. Digital copies are far less likely to get lost than paper copies, which can easily be damaged or stolen. You can either take photos of documents or scan them in, depending on what you have available. It’s most important that the data is legible. Receipts are particularly important to digitize because many of them will fade over time. Ideally, your records should be kept in multiple places. Online storage, an external hard drive, and a paper copy will all ensure that it’s unlikely that you’ll lose your notes. You can even download an app that you can use to inventory your home and keep your data in it ( iOS | Android ) . This can be very useful, because you can immediately make a claim with the information from the app. You can also export the information to save it separately. 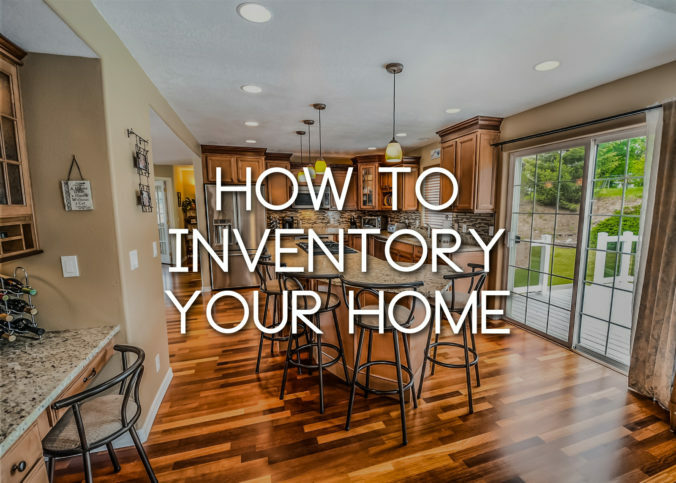 Get started on your home inventory today to protect yourself from potential disaster. Every year, inventory your home for new items and make sure you keep documentation as you add items to your property. If you ever need to put in a claim, you’ll find it much easier. Being an independent contractor certainly has its perks: determining your own projects and hours, choosing your own pay scale and not having to answer to a corporation or company that doesn’t seem to care so much about the individual worker. That said, sometimes there are downsides to being independent. For example, it can be a lot easier for disgruntled clients to sue you, and the damages can be far more costly without a larger company backing you up. Here’s what you need to know about independent contractor insurance. Clients can become unhappy with contractor work for a wide variety of reasons, many of which can lead them to file a claim against you. More often than not it is because the work did not turn out to meet the client’s expectations, but lawsuits can also arise from flaws causing the client or someone else getting injured, from the work not meeting the client’s community or municipal standards, etc. It is true that liability insurance can seem like an unnecessary expense when you take a look at premium payments. But the truth is that you can often work out an affordable payment plan, and the cost of premiums pales in comparison to the cost of a lawsuit. Having a good liability policy in place ensures that you don’t end up using your own money to pay for legal claims, which ultimately can mean the difference between staying in business and being forced to close due to bankruptcy. Depending on your location, there may be some local laws in place concerning your insurance requirements. In some areas, for example, independent contractors are required by law to have a minimum coverage limit of $1 million. The next step is to talk with an experienced insurance agent about finding a policy that both fits your needs and follows the law.